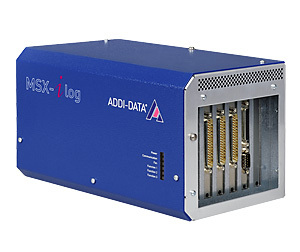 The intelligent Ethernet data logger with analog inputs and digital I/O MSX-ilog-AI-16-DIO40 has 16 differential analog inputs, 16-bit, with a transfer rate of 200 kHz as well as 36 digital inputs, 24 V. Four additional 24 V digital outputs are available for the switching of actuators and the transfer of signals. It was developped for long-term recording of analog and digital signals with one platform. The parametering and visualisation of the measured values are carried out via an integrated web site which is accessible over a standard browser (Internet Explorer, Firefox) with Java from version 1.6x. Thus no additional software installation is needed. The acquisition, visualisation and data storage take place automatically. Thanks to the degree of protection IP 65, numerous protective circuits and an operating temperature from -40°C to +85°C it is also suitable for use outside.